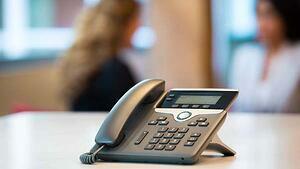 What is the Best Business Phone Model Handset to use with a Cloud-Based PBX? 10 years ago, our customers almost always purchased a premise-based PBX from Atlantech Online when engaged with us for a new PBX. Now, customers rarely elect for a premise-based PBX, choosing instead to go with a cloud-based private branch exchange (PBX). In our experience, customer satisfaction with either a premise-based or cloud-based PBX has centered on how the user feels about their handset. Though with a Cloud PBX you can work without a handset on your desk, most users, especially older members of our customer workforce, insist on having a business handset phone model that works well and feels good in their hand... or against their face... throughout the workday. The number of handset choices is plentiful and there is a handset designed for almost any situation. So how do you find the best fit for your needs? We've provided top-notch telecommunications services to businesses in the Washington, D.C. area for 20+ years, so we know what works best for cloud-based PBX. We'll share our lessons learned with you below. There are many benefits to using a cloud-based PBX phone system. For one, it can save you a decent amount of money by providing a reliable, feature-rich tool for your business communications needs. While this list is not comprehensive, making the right choice is predicated on identifying your company's specific needs. To do that, decide what the best phone system for your company is and then check out our list of the top business handset phone models that make use of some excellent features. The Polycom VVX is one of the most reliable, user-friendly, and feature-full handsets on the market. It's also one of the highest rated business landline phones you can find. Models range in size and price, from the VVX300 and 400, that are recommended for new VoIP users because of their ease of use, to the larger screen VVX1500. These models come with the standard features of Polycom VoIP phones, like call forwarding, three-way conferencing, do not disturb modes, call transferring, and voicemail. The hardware provides an outstanding speakerphone as well as HD voice clarity. The phone can be adjusted to three different angles to suit the needs of the user. The standard models come with 100mb ports, allowing you to link to your computer with the same ethernet connection, or you can upgrade models to use dual gigabit ports. If you'd like Blue Tooth capabilities, the VVX600 model enables pairing with headsets. This is great for those who prefer to lose the cords, freeing you to move about your office while you talk. You can also select a model with a built-in camera, allowing you to conduct video conferences right from your desk. USB ports allow you to connect a zip drive to record calls and a display on the screen shows how many available hours you have remaining on the device. Additionally, your keyboard and mouse can integrate with the phone, allowing you to scroll through your favorites list and dial with ease. These phones can integrate software, giving you more customization and the ability to use your company's go-to applications, right from the base. With the Polycom VVX, you can view Outlook Exchange calendars from the phone's screen and dial into conference calls directly. You can view the day's weather, news, stocks, and many other applications directly from the base. Color screens are only available on the higher-end models, but even the grayscale of the VVX300 is clear and readable. 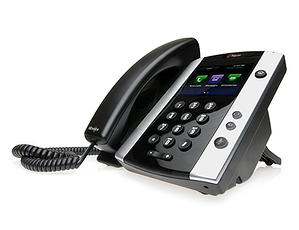 If you're looking for a luxurious landline phone, Polycom VVX models are an outstanding option. And even if you select one of the lower-level models, you'll still find many great features that make this a worthwhile phone. I think so highly of them, it's what I use. I have a VVX 500 in the office and a VVX 400 at the home office. Cisco's 68xx Series landline phones are and affordable model and have numerous upgrades, depending on your requirements. Gigabit Ethernet switch ports come standard with the 6800 series and work with a connected computer, reducing cabling and lowering installation costs since they don't need their own jack in your office wall. The phones also come with speed dialing, hold/resume functions, transfers, and other standard business landline phone features. The baseline model comes with two programmable lines and a headset port. Cost and features increase from there, adding a local power adapter, key expansion modules, and additional lines to program. This system is most ideal for a company looking to upgrade from their analog or outdated digital-based platforms. Unlike the Polycom VVX models, Cisco's 68xx Series only comes with grayscale displays, so if you're looking for a more colorful option, this may not be for you. While the landline model only has a single-position foot stand, it can also be mounted on a wall or anywhere else you can set anchors. For an affordable alternative to get your company into the cloud-based PBX landline realm, Cisco's 68xx Series phones are a great start. 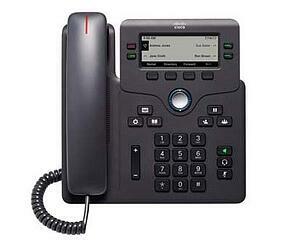 Cisco's 78xx Series landline phones build from the base that the 68xx Series establishes. In addition to all the previous features, these handsets come with better quality audio and significantly more security features, including password logins, encrypted configuration files, and HTTPs secure provisioning. The 78xx Series adds an intercom feature, hot-desking for offices where employees move around, and a larger directory that includes a local phonebook, intelligent search, and reverse address lookup. Like the 68xx Series, these come only in grayscale displays, so if that's an issue, you'll have to upgrade to the 88xx Series. If you're only looking into upgrading for the additional features and added security, then the 78xx Series is what you're looking for. Another attractive option in Cisco's handset lineup is the 88xx Series. These build further on the previous models but feel like a different landline option altogether. These are best for small and medium businesses looking to upgrade to a higher-quality telephone. 88xx Series models are the first to add color to the high-def video display (the 8811 and 8832 do not). Additionally, they offer Picture-in-Picture (PiP) and camera exposure control for the built-in 720p video camera. They come complete with the gigabit integral switch and a minimum of five programmable keys. Some models work with Bluetooth headsets and the pricier versions come with their own Wi-Fi, in case you need to disconnect from the computer. Upgraded models come with USB ports, visual message indicators, and a few more layers of security. 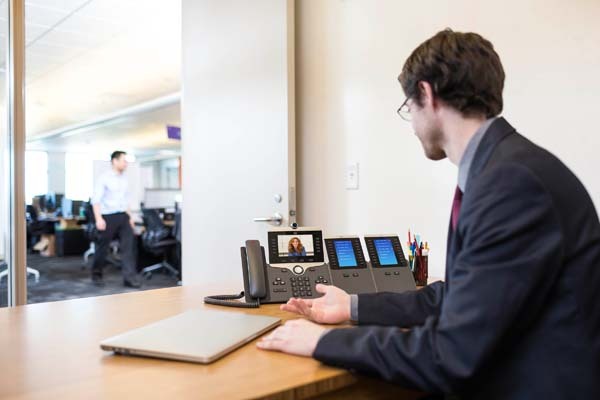 These are the most expensive of the Cisco business landlines, but if you're looking for more features than its predecessors, it's worth the money. Last on the list are the Yealink business handsets. 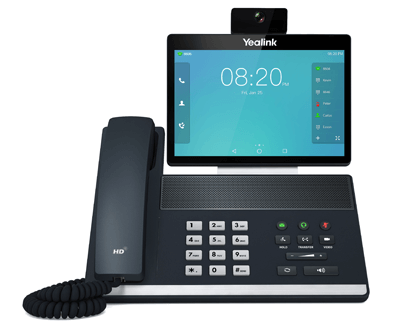 Yealink offers a wide range of models, from their T2 through T5, and phones specifically for conference calls. For their flagship product, look at the SIP-VP59. These phones come with a high-definition, full-color 1080p display, adjustable HD camera, and built-in Yealink Noise Proof technology which eliminates all sounds that aren't human voices from calls, giving you almost crystal clarity in conferences. Models can be upgraded for better quality handsets, or for cordless options. Callers have access to instant content sharing over the call, sending data to bring everyone up to speed faster than with traditional avenues. While there are many more models of business landline phones out there, these five are some of the best and highest reviewed on the market. They have extensive features and paint a better picture of the possibilities for cloud-based PBX phones. 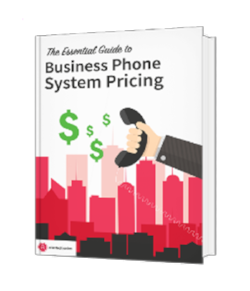 It's important to remember that phone system pricing isn't always straightforward, given the many factors that play into your requirements. You want the right solution for the right price. To help, we've build a guide that covers the main factors that will affect your final price tag. If you're finding it difficult or overwhelming to decide, we'll cover everything you need in the Essential Guide to Phone System Pricing.